In this story, the Good Samaritan was a neighbor to the injured man. Are animals our neighbors? To be sure, animals can be our friends and protectors, just as the Good Samaritan embraced the injured man. Should we, likewise, befriend and protect animals? I think so, because we have something fundamentally in common: We all have received the spark of life from God. 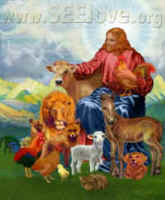 The Bible forbids cruelty to animals and teaches that God cares about animals. For example, after the Flood, the Bible describes God’s covenant with all Creation, including the animals, to not flood the earth again. According to the Bible, in God’s eyes, we are one community. We are not equal members of that community – humans, created in God’s image, have special privileges and responsibilities. But, when we forget who are neighbors are, we tend to abuse those privileges and renege on our responsibilities. I would also like to point out that Jesus taught that we should love ourselves, as well as our neighbor. This makes sense when we recall that we are creations of God. Some religious authorities teach self-loathing, evidently in an effort to combat the human tendency towards narcissism. Other authorities encourage people to promote their own self-interest, which is a welcomed message for those with power and money but neglects the weak, vulnerable, and poor people with whom Jesus so often identified. Jesus did not promote either deception – self-loathing or self-aggrandizing. In loving ourselves, we care for our bodies and attend to our needs. In loving our neighbors equally, we don’t take self-love to unhealthy extremes. Next week, we will explore how loving our neighbor and loving our enemy (Mt 5:44; Lk 6:35) are related.